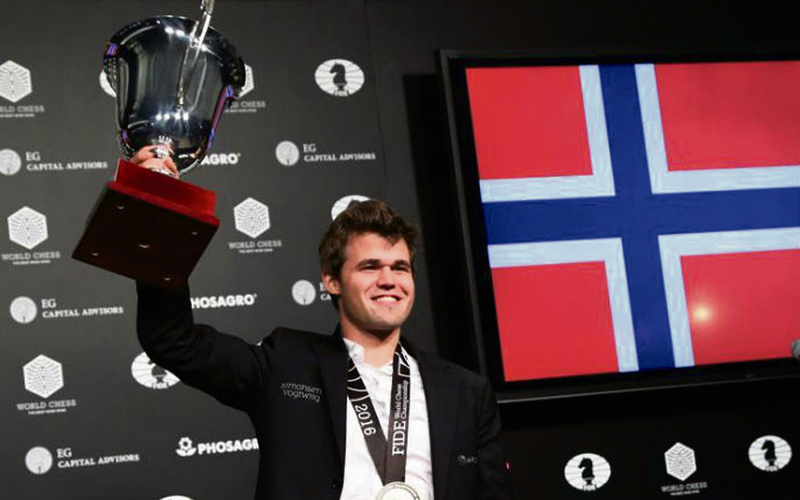 Norwegian Magnus Carlsen extended his dominance over the chess world by winning the World Chess Championship for the third consecutive time, beating his Russian challenger Sergei Karyakin in a tiebreaker. The win puts Carlsen closer to the status of chess legends such as Garry Kasparov, who dominated the game for 15 years. Although Karyakin foiled predictions by tying Carlsen in 12 regular rounds, the Norwegian champion beat him in the final phase of four quick-fire extra games. The battle for the world chess crown ended up in the dramatic tiebreaker after a win apiece and nine draws. So the young stars - both aged just 26 - headed into the chess equivalent of extra time in soccer. Unlike the earlier rounds, which lasted an average of six hours, the rapid-play rules meant the players had just 25 minutes each, so each game was over in an hour. The accelerated games left plenty of opportunity for harried mistakes, and while predictions were difficult, Carlsen - a king of the blitz format and world number-one since 2010 - had remained favourite. The Norwegian, who turned 26 last week, has played several blitz tournaments this year, beating US grandmaster Hikaru Nakamura in one in October. But he has occasionally shown flashes of losing his cool, as when he slammed the door of the press room after defeat in the eighth round, earning a fine of five per cent of his prize money. Carlsen won the championship - organized by the International Chess Federation, FIDE - in 2013 and 2014, beating Indian Viswanathan Anand. Karyakin, a child prodigy who became the youngest ever chess grandmaster at the age of 12, has known Carlsen for years and had little to lose, with no one even having expected him to reach the final. "Sergei has impressed everyone with his tenacity these last few weeks so he is perfectly capable of pulling an upset," said Wesley So, who travelled to New York from Minnesota to watch the clash.